And here at last we have it – the first commercial release of the legendary BBC broadcast from 1979 of Bantock’s massive masterpiece Omar Khayyám. I describe this performance as legendary on two principal grounds. Firstly, it was the recording whereby most devotees of the composer will have got to know the work, either on its initial broadcast or in a repeat some four years later. Secondly, the CDs from Chandos, which appeared in 1997, made a number of cuts in the score totalling some twenty minutes of music; the recording under consideration here is complete. I will return to the matter of these cuts in due course, but initially it may be useful to explain why this performance was so important in its own right. During the early years of the twentieth century Sir (as he was later to become) Granville Bantock held a position in his generation second only to Elgar in reputation. In due course he was joined by Holst and Vaughan Williams from the younger ranks of English composers, but at the same time he also suffered from the fact that, while he considerably outlived Elgar, his style formed in his earlier years hardly evolved at all. By the 1940s his music was regarded as irredeemably old-fashioned, and he was accorded only a couple of pages in Bacharach’s Penguin compendium British Music in our Time; although the discography attached to the second edition of that book shows that he was still highly regarded enough to have a very considerable number of his orchestral works available on record. However, after Sir Thomas Beecham’s recording of Fifine at the Fair in 1950, which was later transferred to LP and eventually CD, these other recordings disappeared altogether from the catalogues. It was not until Norman Del Mar recorded The Pierrot of the minute for Chandos in 1987 that any further discs by professional orchestras were released. 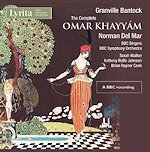 The baton was then taken up by Vernon Handley in a valuable series of CDs for Hyperion, which included all the symphonies and a number of other major works, but only two brief extracts from Omar Khayyám. Handley eventually recorded the ‘complete’ work for Chandos on three CDs, but, as stated above, he made a number of cuts to the score – possibly in a vain attempt to condense the work onto two discs – which made the desire for a truly complete recording all the more pressing. Regarding the matter of the cuts, it is true that Edward Greenfield, when reviewing this BBC broadcast, complained of the excessive length of the work, and Bantock himself allows for various abridgements in the published vocal score (of which more later). However, Rob Barnett in his booklet note for this issue refers to these excisions as having been made through “gritted teeth” and they seem to have originated during the First World War, when Bantock gave permission for the whole work to be staged as an opera-ballet to be conducted by Beecham. The fact that the cuts consist more of choral passages than solo ones would tend to reinforce that suspicion. Also, on a purely practical note, it seems perverse that, with a work, whose reputation for sheer scale constitutes for most listeners the greater part of its claim to recognition, a recording should actually adopt the path of practical expediency designed for a specific occasion. The scale is certainly evident, not only in the length of the work but also in the orchestral forces used – not only quadruple woodwind, six horns and so on, but also a double string orchestra, the sections of which are frequently set against each other dramatically with one section muted while the other remain unmuted, a technique Bantock adopted from the love duet in Tristan und Isolde. The size of the orchestra clearly calls for a large chorus consisting of amateur singers, precisely the arrangement Bantock himself adopted for early performances. For the BBC Del Mar employs an expanded choir based around the BBC Singers, which, it appears, had limited rehearsal time to become acquainted with the music, whereas Handley employs the most substantial forces of the BBC Symphony Chorus. Neither of these really packs the punch that a really large body of amateurs could have produced — in places divided into sixteen parts — but where are such adventurous bodies to be found nowadays? To return to the matter of Handley’s cuts, however, there are some additional considerations to be borne in mind. In the first place Del Mar, too, makes some excisions from the score in Part One, but these — unlike Handley’s much more substantial omissions in both Parts One and Two — are those marked by the composer in the vocal score with the cryptic footnote “in case of performance to be omitted.” Bantock even goes further by writing into relevant bars cues for the voices, which otherwise make nonsense of the text, but the footnotes themselves are puzzling since they leave the reader of the score mystified as to why these passages were included in the published score at all; additionally some have thematic significance. Maybe Bantock decided on them after the vocal scores were printed, and the cost of resetting the relevant pages was prohibitive; they extend in length from single bars to one whole page of an orchestral interlude in one of the choruses. Given this precedent, and although some of Handley’s cuts rob us of some very imposing and dramatic music, it is perhaps better not to be too judgemental. The cuts mean that Handley can make the inevitable change of CD during Part One during a silent bar instead of in the middle of a sustained note as the Lyrita engineers have to do here. Given the pros and cons of the matter, therefore, how do the two performances compare? Well, to begin with, the sound on the Chandos recording is considerably cleaner and clearer than that on the BBC tapes from nearly twenty years earlier, a matter which is immediately noticeable in the crisp percussive rhythms which accompany the opening chorus, which are muddied beyond recognition with Del Mar. Also with Handley we register the contrast between two semi-choruses, to the left and right of the stage, at the line “and strikes the Sultan’s turret”. Although Handley’s chorus is more distantly placed, the clarity of the sound helps the lines of the writing to make their proper effect, with the semiquavers in lines like “Open the door” much more precisely articulated; also Handley’s BBC strings are more assured than Del Mar’s players in some of the many dangerously exposed florid passages, which they have to negotiate. Similarly the passage for chorus singing with closed lips near the start of the Camel caravan (CD2, track 1 in this recording) is much more atmospherically distant in Handley’s hands; and the chanting from the Koran (CD3, track 1) marked in the score to be sung “behind the scene” is very much to the fore with Del Mar, again to the detriment of the effect which Bantock clearly sought here. Regarding the solo singers, while honours are approximately even between Catherine Wyn-Rogers for Handley and Sarah Walker for Del Mar, the men make more of a contrast. Anthony Rolfe Johnson for Del Mar is richer in tone and more heroic in manner than Toby Spence for Handley, in a part that really requires that greater degree of lyricism. However, someone really should have stopped him singing “Satan” instead of “Saturn” at CD1, track 7, 6.04 – unless it was a slip of the tongue in the heat of a performance with presumably no opportunity for retakes. Then on the other hand Roderick Williams (in the Handley set) is much more persuasive as the Philosopher than Brian Rayner Cook here. I have admired this underrated and forthright singer in other recordings of the period, but he sounds in gritty voice for Del Mar, indeed almost villainous in places – although he is more alluring in his long solo near the beginning of Part Two, with some delicate shading of the text. In Part Three there are six brief solos for the ‘pots’ – Handley assigns three of these parts to the principal soloists, and three to other singers; but Del Mar here has all six parts sung by soloists drawn from the choir, among whom only Michael George really distinguishes himself. The booklet notes by Rob Barnett provide a really comprehensive introduction not only to the history of the music and its performance, but also a survey of the circumstances surrounding the broadcast of Omar Khayyám, which provides valuable insights. It does not duplicate the closely argued analysis of the music that Lewis Foreman furnished for the Chandos box, which included a schedule of the various leitmotifs that Bantock identified for the benefit of Ernest Newman at the time of the first performance. It has to be said that, although the music is very clearly modelled on Wagnerian principles with a network of closely argued symphonic themes, the titles for these do not really convey very much, since Bantock’s use of them is more atmospheric than dramatically motivated. It must also be conceded that, with the music faithfully reflecting the contrasted succession of the original quatrains in Fitzgerald’s translation, the individual sections of the score do not always cohere very convincingly into a unified whole. No translation is provided of the notes, or the text, but the vocal score published by Breitkopf and Härtel gives a German singing version (which for some obscure reason ceases abruptly half-way through Part Three), and re-translations of the Fitzgerald are presumably not hard to find. The discs here also include the contents of a second BBC broadcast conducted by Norman Del Mar, made some ten years earlier for the Bantock centenary in decidedly mono sound. I have to say that, quite apart from the unpleasantly close microphone placements, these hardly really justify resuscitation. In the first place, Del Mar adopts the cuts that Beecham made to the score of Fifine for his 1950 recording (he may well have played the horn on those sessions), which means that Handley’s absolutely complete performance on Hyperion remains unchallenged in the catalogue. Secondly, we are only given extracts from Sappho — and, oddly enough, not the same songs that Bantock himself selected when he gave public performances of abridged versions of the work. Johanna Peters, in other circumstances a singer of superlative diction (think of her Florence Pike in Britten’s own recording of Albert Herring), chews up vowels and consonants in an almost impenetrable manner, which sends the listener scurrying to the booklet for enlightenment. Again, Handley has given us all of the songs on another Hyperion disc. Finally the performance of The Pierrot of the Minute comes into direct competition with Del Mar’s own later Chandos recording, with a better orchestra and immeasurably superior recording quality; Handley also included the work on a Hyperion CD. In the end that really is of little consequence, especially when Lyrita have made all four CDs available at what is effectively super-bargain price. What really does matter here is the complete Omar Khayyám. Fans of Bantock will presumably already own the Handley recording, and will need no encouragement to invest in this new release for the sake of some twenty minutes of music which will be unfamiliar to them. Those who are more sceptical about the worth of the score will perhaps welcome some more general description of it. There are clear echoes of Wagner (notably a near-quotation from the Forest Murmurs) and Delius (the ending of A Village Romeo and Juliet) as well as plentiful orientalism that will recall similar music by Rimsky-Korsakov. There are also elements of more modern orchestral writing, including a couple of startling trombone glissandi, which are presumably intended to illustrate the reference to “lions” in the following quatrain (CD1, track 5). This, however, sounds unmotivated with Handley, who cuts the relevant chorus. Also, the style of the vocal writing is more progressive than we find in Elgar, bearing a closer resemblance to that of Strauss in his operas or Schoenberg in his Gurrelieder. In fact it is a work clearly of its time, the period just before the First World War, and with the greater readiness of the public to investigate such music in recent years, it may well be a piece whose time has come again. It is certainly no more difficult for performers than the late Elgar oratorios, and would well repay investigation by modern choral societies ... and by listeners as well. When I wish to listen to the score, I will turn to Del Mar for preference so as to hear the atmospheric passages such as the Poet’s Tristan-like “I sent my soul through the invisible” - the only section of Part Two which Handley cuts, and the most regrettable of his excisions. For newcomers to the score, I would have to recommend the Handley version for its better observation of detail; however, his cuts even in Part One really are a fly in the ointment, and those who are persuaded by him to fall in love with the music will find that, for a fuller appreciation, they will certainly need Del Mar as well. The recording comes from one of Richard Itter’s home tapings, not from the original BBC transcription, but the sound is nevertheless excellent.